AFP crafted this thank-you image before Corbett’s announcement. Pennsylvania will not set up its own state-based health insurance exchange under the new health care law, Gov. Tom Corbett announced Wednesday. “I have decided not to pursue a state-based health insurance exchange at this time. It would be irresponsible to put Pennsylvanians on the hook for an unknown amount of money to operate a system under rules that have not been fully written,” he said. Pa. is the 28th state to decline federal funds to enact the plan, a key component of the Affordable Care Act, aka Obamacare. The deadline for a decision on the plan is Friday, but Corbett said too many details were yet outstanding. He blamed President Obama’s administration, namely Health & Human Services Secretary Kathleen Sebelius. “Healthcare reform is too important to be achieved through haphazard planning. Pennsylvania taxpayers and businesses deserve more. They deserve informed decision making and a strong plan that responsibly uses taxpayer dollars,” he said. He added that he’s still seeking more details as he examines the law’s proposed expansion of Medicaid. The move opens the door for the federal government to set up its own version of the exchange for Pa.
His move prompted celebration from conservative activists who have been lobbying against a state-based exchange, noting that accompanying federal funds would be only temporary. AFP actually announced its support for Corbett’s decision before it was made public, as the Philadelphia Inquirer’s Amy Worden noted. From the Democrats’ point of view, this is great news. This is likely the high water mark for Republican control of state government, and if they had decided to design the state insurance exchange regulations they could’ve done a lot of damage to the cause of universal health care. They could’ve really fragmented the insurance market, they could’ve passed a really stingy essential benefits package, they could’ve written really weak consumer protection rules, etc. Now Obama’s HHS is going to be in charge of all those details, and Pennsylvanians will have access to the sort of well-designed insurance exchange Obama and the Democrats intended. Any updates on Corbett and where the Exchange is as the first of October comes? I know here in Michigan our Republican governor wavered for a bit on the exchange, and then finally gave in. Way to go Corbett! The federal exchange that will be availabe to Pennsylvanians will be much more consumer friendly than the insurance company sellout that your administration would have set up. You’ve done all of us a favor. And in the long run, the moves by the GOP governors will hasten single payer. The GOP will come to rue this day, short term propaganda gain followed by long term loss by their greedy insurance company fiends. What took so long? That wet finger in the air finally detected dissatisfaction from the base with a possible primary challenge? Gee. Thats right Gov. ; I guess business and individuals would rather pay 5,10 or even 20 increases per year to their health nsurance carriers; at least that is something they already know all about. Thank you gov. corbitt for rejecting a plan that has not been thought out…whose ramifications are far more reaching than the average Americian seems to understand..a plan that leads to more questions than answers ..a plan that most small businesses men and women can hardly understand or afford! Thank you Governor Corbett for standing on firm ground on this issue…. This will be a disaster in Pennsylvania. Thank you, Gov Corbett! Obamacare is a disaster in every way possible: economically, financially, and constitutionally. Opting out of the Obamacare exchange protects businesses and individuals from most of Obamacare’s taxes and mandates. Again, way to stand up to tyranny and protect our liberties! To the libs who were rude and crude in their postings. The state I am in could not wait to jump on that lack of a real plan obamacare and I can from personal exp, forget that I took the time to read that complete disaster of the ditherings of the the o admin, I can tell you , you are not going to be receiving good health care, as a matter of a fact your pres and your admin have gone out of their way to make it very difficult and very exp for you. So, if I were you I would thank your Gov. A better headline would have been, “Corbett secures Lifetime Annuity for himself from the Koch Brothers.” I wonder what the quid pro quo was, for keeping all that business out of the hands of local businesses – must have been major moolah! AFP is nothing but an astro-turf front group for the Kochs, and the reporter should have disclosed that – there are NO grass-roots members of that PR outfit, only Koch-paid employees. I should think the local insurers and brokers would be the ones most pissed off by Tom’s sell-out, since they will have no influence over the plans to be offered. I hope they thank Tom properly in 2014! 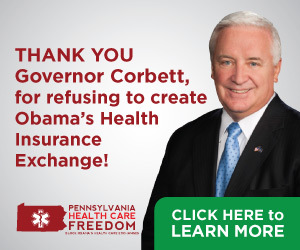 Governor Corbett is doing a good job on the ObamaNoCare issue. This is great news.